August 24th, 2013 - Chandler Petty Motorsports traveled to West Plains Motor Speedway (West Plains, Missouri) on Saturday evening for a NeSmith Weekly Late Model series Event, which served as a tune-up race for next weekend's NeSmith National Tour event. Eighteen entries entered the program, and Petty started his evening by winning his heat race from the 4th starting spot to earn the 4th starting spot for the feature. As the feature went green Petty wasted little time jumping to the lead and had motored away from the field by a straight away, when a right-rear flat forced him to the pits. He headed pitside for fresh rubber and rejoined the tail of the field before rebounding to a 5th place finish behind race winner, Kevin Collins, Gary Stolba, Chad Williams and Jerry Buck. Full results from the race are available at www.WestPlainsDirt.com. 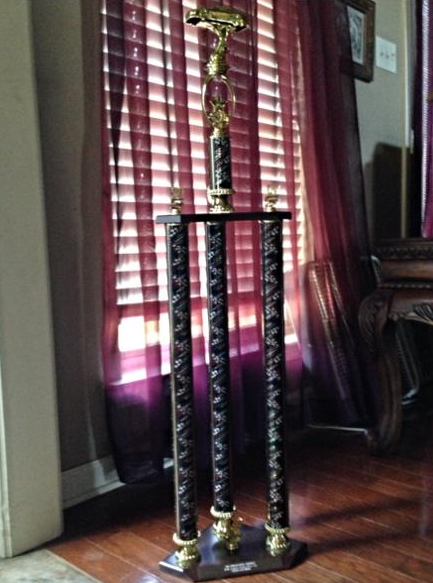 August 10th, 2013 - The team traveled to Timberline Speedway (Corley, Texas) over the weekend to take part in a doubleheader with the COMP Cams Super Dirt Series (CCSDS) Super Late Models at the 1/4 mile oval. With 18 entries on hand for Friday's $2,000-to-win, program, Petty advanced from his 5th starting spot to finish 3rd, which locked him into the 7th starting spot for the 30 lap feature. In the main event Petty quickly worked his way up to the 6th position, but with passing being difficult he would be unable to advance any further as he finished 6th. Saturday night's program fell victim to rain. 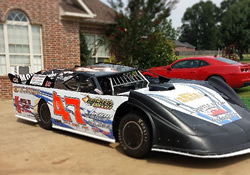 August 3rd, 2013 - Chandler Petty opened a doubleheader weekend with the COMP Cams Super Dirt Series (CCSDS) in the state of Arkansas on Friday night with a trip to North Central Arkansas Speedway (Yellville, Arkansas). Nineteen entries took to the 3/8 mile oval as Petty debuted the new look on his #47 Rocket Chassis. After finishing 2nd in his heat race Petty started 5th in the feature and would race in the top five for much of the event before settling into a 6th place finish. Saturday night found Petty competing at I-30 Speedway (Little Rock, Arkansas) in a $2,500-to-win race at the 1/4 mile oval. With heavy and fast conditions present Chandler earned the 10th starting spot for the feature before mounting a solid charge to a 3rd place finish behind race winner, Jack Sullivan, and Kyle Beard. Chandler is now 2nd in the latest series standings. Complete standings and full results from the event are available at www.COMPDirt.com.